Balloons Over Atlanta makes balloon palm trees for tropical, summer, pool party or Hawaiian themes. We also create sculptured Christmas trees, toy soldiers, reindeers, candy canes and much more to enhance any themed party. Consider heart or star shaped arches and even your logo created from balloons. Balloons Over Atlanta specializes in weddings, corporate events, grand openings, carnivals, fairs, conventions, trade shows, and holiday parties. We offer custom sculptures and logos in addition to advertising balloons, arches, bouquets, centerpieces, columns, floral decor, and helium supply. The use of classic balloon decor's simplicity, flexibility, and natural ability to transform large spaces into celebrations, make it suitable for a broad range of events and clients. Balloons give clients the most atmosphere, visual impact, excitement and value for their money. 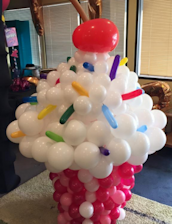 Balloons Over Atlanta creates balloon sculptures to complete the theme selected for your Christmas, corporate, university, birthday or anniversary parties, grand opening, convention booth or other convention events. A wedding reception is also an ideal place to have balloon sculptures made to complement the theme and venue selected for your party. We know how to make balloon sculptures that are one of a kind to give your event a unique, unforgettable touch. Let our specially trained staff of event planners show you how to get the most with your decorating budget. Balloons Over Atlanta is a company with Certified Balloon Artists (CBA) and Certified Special Event Professionals (CSEP). Our staff of professionals that can plan the entire event for you or any part of the event that requires a professional touch with decor that is sure to make your event magical.